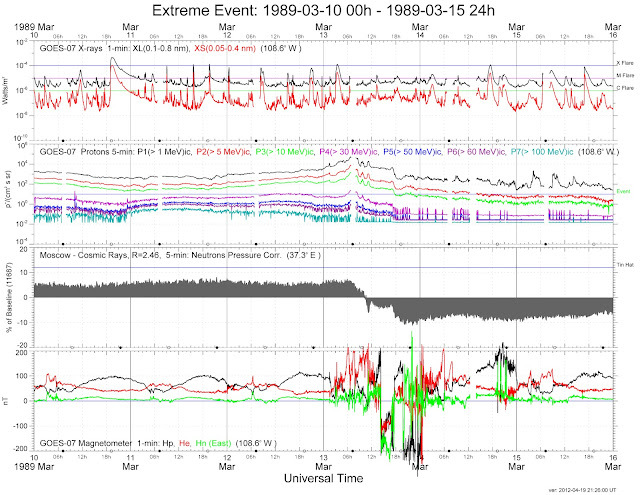 At 2:44 am on March 13th, 1989 a disruption in the Hydro-Quebec power grid ripped through the high voltage transmission network. Single-phase 735 kV transformers were blown offline due to the tripping of seven static compensators critical to maintaining the stability of the massive La Grande network. The instability caused overloading in the Manic and Churchill Falls networks, leveling the entire 20,000 MegaWatt electric grid of Quebec in 92 seconds and rocking large portions of the electrical grid in the northeastern United States. It is well known that the immediate cause of the disruption was a massive geomagnetic solar storm; that and the fact that Hydro-Quebec is a socialist state-run commie enterprise (that's right, socialist and commie!) and deserved to go down. Hard. In the subsequent twenty-three years a raft of papers have been produced by everyone from independent researchers to NASA to Hydro-Quebec itself looking at the solar event and electrical disruption, and the blackout has become an important benchmark for testing and modeling the robustness of North American electrical infrastructure as US and Canada have grown more reliant on electricity in general and their respective power grids have further intertwined. But what we're interested in today is the question what might be gained from theorizing the blackout event as a landscape, and how might landscape practice contribute to the future evolution of the North American power grid? As the Friends of the Pleistocene has noted before the electrical infrastructure of northeastern North America is a bewildering network of twentieth century public works projects, the desires of modern urban inhabitants, and geological forms hundreds of millions of years old. Taking the singular case of the 1989 blackout is helpful for understanding this landscape of power. In particular two factors of the Hydro-Quebec system contributed to the disturbance effect instigated by the solar storm, and each of these has a history: the “highly resistant igneous rock” of the Laurentian Shield, and the technologically innovative 735kV transmission lines pioneered by Hydro-Quebec. 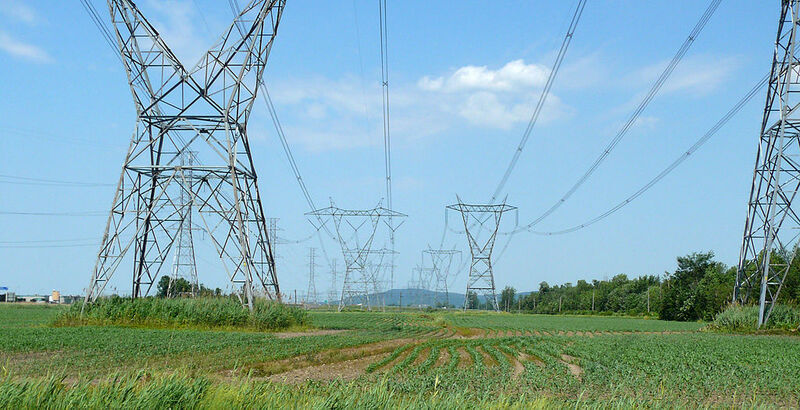 According to reports by the Federal Energy Regulatory Commission and the North American Electric ReliabilityCorporation, the impact of the geomagnetic storm on the Hydro-Quebec grid was intensified because of the subsurface geology of the region. The “highly resistant igneous rock” over which the transmission network passed made it difficult for the excess voltage to pass through the ground, thereby contributing to the overloading of the transmission lines. Only in this case the revolution was taking place at the temporal and spatial scale of the American landscape, unlike anything Lefebvre was looking at in his native France, and this landscape necessitated technological adaptations including the 735kV transmission lines. This technology was pioneered by Hydro-Quebec during 1962 under the guidance of engineer Jean-Jacque Archambault as a response to the necessity to span the massive distances between where the hydroelectric power was produced in Northern Quebec and the populous belt near the Canadian-US border. This effort to create energy and economic independence within the province of Quebec through large public works projects was also intricately tied to the Quiet Revolution separatist movement within Quebec that was taking shape at that time. To transport the power generated from the massive new Outards and Manicouagan hydroelectric projects 735kV lines were proposed, an increase of more than double the 315 kV lines that were standard. 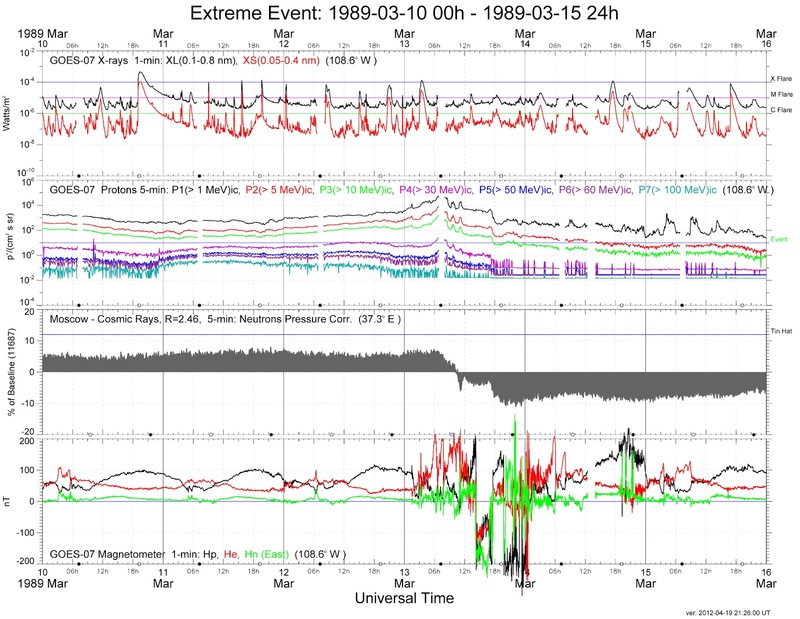 While this technology was necessary to link the Manicougan-Outards project to Montreal and other cities in the south, it also left the electric grid highly susceptible to disruption from geomagnetic interference. That the Manicouagan Lake would become the object of Quebec engineer’s fascination is not surprising. 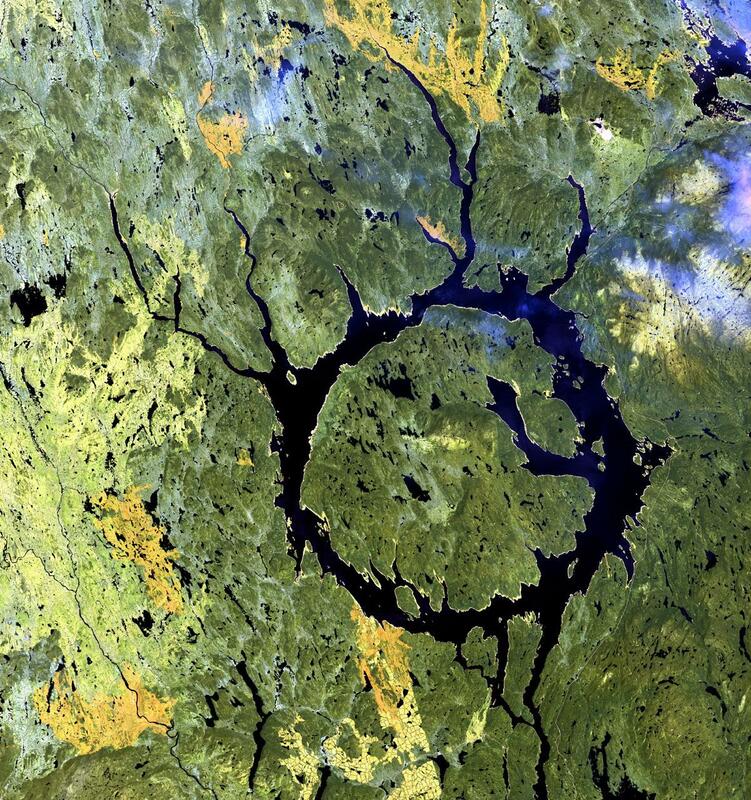 It’s size, geographic location and geologic structure enable it to contain a huge amount of water and keep it in reserve for electrical power generation; it is the highly glaciated remnant of an impact crater created by an asteroid nearly 215 million years ago. What is surprising is the way that this artifact, now a primary powerhouse for the urban population Northeastern North America, is connected not only to urban centers such as Montreal, Ottawa, Boston and New York, but also to impact sites in France, Manitoba, the Ukraine and North Dakota. Incorporating plate tectonics has allowed researchers at the University of Chicago to map geographies in geological time. With respect to the Manicouagan Crater, this research suggests that all five seemingly disparate impact sites resulted from a single event, possibly an object that broke up as it entered the Earth’s atmosphere. What begins to come in to view when theorizing the 1989 blackout from a landscape perspective is a complex geo-socio-technological object that is massively distributed in space and time; though the event is singular it implicates 215 million year old asteroid events, separatist Quebecois, pioneering engineering concepts, 735kV delta pylons, glacial melt, and one particularly nasty solar flare on March 10th that rocked the Earth’s geomagnetic field. Through the work of people like Lefebvre we can understand that the city is the urban are not the same, that each has a history. In many ways, this insight from 1970, and later so clearly articulated by Cronon in Nature’s Metropolis, seems to be gaining a new appreciation with the recent declarations out of the GSD that any concept of landscape urbanism must mean a lot more than simply city landscapes. So to clarify for me, this post was in essence an excerpt from page 251 of Guerrilla Metaphysics, by Graham Harman? ha! yes. basically... it's a good read, and not too expensive. I recommend it. and thanks, Nam, it's good to be here. O’Grady’s Landscape can meet all your landscape needs. We handle all types of landscape issues, including grading, drainage systems, lawn renovations, and more. Our experienced staff can design an effective and affordable solution for you. Request a consultation for any of the services listed below. We respond promptly to consultation requests, and you’ll get an estimate within a week. Here O'Grady's Landscape you can find more.